The Event Horizon Telescope team has a big announcement on April 10. A computer-simulation view of a supermassive black hole at the heart of a galaxy. The edge of the black central region represents the event horizon, beyond which no light can escape. 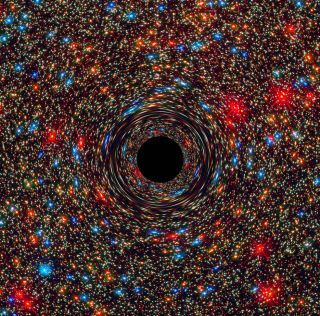 We may be about to get an epic and unprecedented look at a black hole. The Event Horizon Telescope (EHT) project, an international effort that aims to capture the first-ever image of a black hole, will announce a "groundbreaking result" at a news conference next week, team members said Monday (April 1). The briefing, which will be hosted jointly by the EHT project and the U.S. National Science Foundation (NSF), takes place next Wednesday (April 10) at 9 a.m. EDT (1300 GMT) at The National Press Club in Washington, D.C. (NSF helps fund the EHT.) And you can watch the big news unfold: The event will be streamed live. Sheperd Doeleman, EHT director, Harvard University senior research fellow, Center for Astrophysics at Harvard and Smithsonian. Daniel Marrone, University of Arizona Department of Astronomy and the Steward Observatory. Avery Broderick, University of Waterloo Department of Physics and Astronomy, Perimeter Institute for Theoretical Physics. Sera Markoff, University of Amsterdam, Anton Pannekoek Institute for Astronomy, Gravitation and AstroParticle Physics Amsterdam. Related press conferences will also occur simultaneously in Brussels; Santiago, Chile; Shanghai; Taipei, Taiwan; and Tokyo, according to the NSF advisory. The speakers at these various events include some heavy hitters, such as Carlos Moedas, the European commissioner for research, science and innovation; James Liao, president of the Academia Sinica; European Southern Observatory Director General Xavier Barcons; and Atacama Large Millimeter/submillimeter Array Director Sean Dougherty. The advisory doesn't state what the April 10 announcement will be, but the above information suggests it's a pretty big deal. "This capability would open a new window on the study of general relativity in the strong field regime, accretion and outflow processes at the edge of a black hole, the existence of event horizons, and fundamental black-hole physics," the EHT team wrote in a project description. "Over the coming years, the international EHT team will mount observing campaigns of increasing resolving power and sensitivity, aiming to bring black holes into focus," the team added. The EHT project focuses on the two supermassive black holes that have the largest apparent event horizons, as seen from Earth: the one at the heart of our own Milky Way galaxy, known as Sagittarius A*, and the monster that anchors the giant elliptical galaxy M87.